Featuring TWO models- Lola Frost and Villainy Loveless! Posted in 2009 and tagged with Lola Frost, Villany Loveless. December 6, 2009 by Shary Contrary. Dr Sketchy's celebrates our ONE YEAR BIRTHDAY with the return of our very first model, Melody Mangler!! One Cool Word magazine will be selling cupcakes and magazines, The Wallflower will be pouring drinks, and you will be getting the bumps drawing Melody's poses! Posted in 2009 and tagged with Melody Mangler. November 1, 2009 by Shary Contrary. There's gonna be a whole lotta shakin goin on at this Rock n' Roll them...ed Dr Sketchy's. 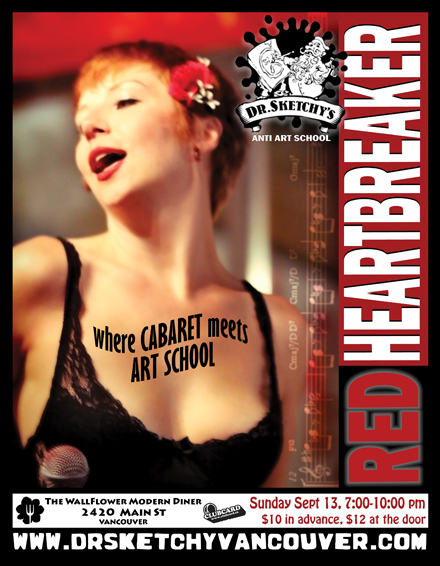 Our rebellious model is Red Heartbreaker from Pink Flamingo burlesque! Posted in 2009 and tagged with Red Heartbreaker. September 13, 2009 by Shary Contrary. Hey all you sketchy monkeys! On Sunday Aug 23, Dr Sketchy's will be hosting a 6 hour drawing session at the Vancouver Comicon! 6 HOURS! 6 BURLESQUE MODELS! Posted in 2009 and tagged with Connie Lingus, Lil Lovroc, Precious Metal, Red Heartbreaker, Via Rose, Villany Loveless. August 23, 2009 by Shary Contrary. Posted in 2009 and tagged with Betty Loop. August 9, 2009 by Shary Contrary.